Before we get all involved in perusing a new book, I want to remind you that there's still time to get in on Friday's Blog Tour & Book Giveaway for Murphy, Gold Rush Dog. What Franny wants more than anything is for a spider to spin "some girl" in a web. What she gets is chocolaty-colored scribbles from a flea. This is a story of friendships made, some remade, of discovery, and of appreciation for the little things in life. There are superheroes. There's a dog, and a horse. There's a bit of magic and some over-zealous application of flea-B-gone. There's a couple different takes on the word "pedestrian" and some insight into the freedom a wheelchair provides (plus how to do wheelies). There is pride, there are falls, there is student protest and, yes, there is even a spider. And for those of us who like a dose of truth with our fiction, there are plenty of pages of authors notes that put this story into the historical context of the polio epidemic and Salk's work to produce a vaccine. Timely reading, as doctors are hard at work on an Ebola vaccine. 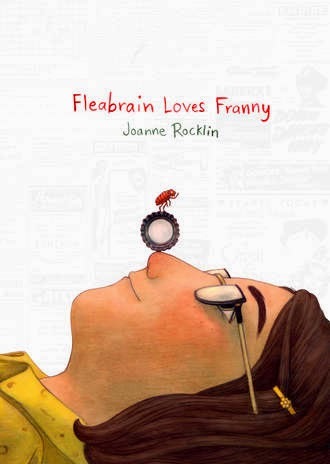 Sally: What inspired you to write Fleabrain Loves Franny? Joanne: I tend to wake up with "a good idea" for my next book, usually just a phrase that doesn't mean much to anyone but me. The phrase for FLF was "you can stop seeking messages in spider webs." Who would send such a note? Who would be seeking messages in spider webs? I did know that Charlotte's Web was published in October, 1952, after a summer of the worst of the polio epidemics in the U.S. in which 58,000 cases were recorded. I realized almost immediately that my seeker of messages would be a young wheelchair-bound polio victim, Franny, in love with the newly published book, and seeking her own Charlotte in dealing with her almost kafkaesque experience. I began to do research about the era and the scourge of polio, discovering, too, that many of its victims were avid readers with active fantasy lives, determined to succeed. Now, I asked myself, who would be the sender of the mysterious message? An erudite, educated writer - a being annoyed and jealous at the adulation of Charlotte, seeking attention and glory as well. Someone unconsciously humorous as well. I needed lots of comic relief. Joanne: I knew that a creature jealous of Charlotte would be a fellow bug. Franny's mother was a meticulous housekeeper, especially with an "invalid" living at home. Cobwebs were immediately destroyed (although she did miss one...) so the bug wouldn't be a spider. Flies weren't around all year. But her dog, Alf, was a faithful companion, a good "host" for one flea the flea powder couldn't destroy...I also liked the name Fleabrain, which is often used in a derogatory way, but in this case meant exactly that. Sally: What sort of research did you do? Joanne: I did a fair amount of research--enough to give an accurate description of physical properties. I actually have a phobia about enlarged photos of bugs and insects, so the research took some courage. During the writing of this book our new cat brought about a flea infestation in our home. My husband was unaffected, but I was covered with itchy welts. When I mentioned to my dermatologist that I happened to be writing a book about a flea, he looked at me strangely and diagnosed "hives", from a possible stress reaction. He was wrong. Anti-flea medication for our cat quickly solved the problem. Today is Marvelous Middle-Grade Monday round-up. Drop by to see what other bloggers are reviewing. This review from an ARC provided by publisher. This looks like a great read. I enjoyed the author interview and hope her the best with this title. Thanks for featuring. Wow! Murphy the Dog and now Fleabrain! You are channeling my brainwaves. This story is sure timely! And how unique! I must sniff this one out! Thanks Ms Heavenrich! Joanne, how funny that your dermatologist thought your itchy welts were from stress and it turned out to be flea bites. This book is already on my TBR list and I'm waiting for my copy to arrive. I like how her idea grew out of the date Charlotte's Web was published. The tie-in with Charlotte and the flea sound interesting. Thanks for featuring it! This sounds like a wonderful book. Thanks for telling me about it.